To make a planned gift to Saint Joseph’s Oratory of Mount Royal is to believe in the mission of Saint Brother André and contribute to the Oratory’s development. Whether it forms part of your financial, tax or estate planning, planned giving demonstrates a heartfelt commitment. It is also an important way of helping the shrine continue its mission for future generations. This is an approach to consider, regardless of the size of your financial wealth. 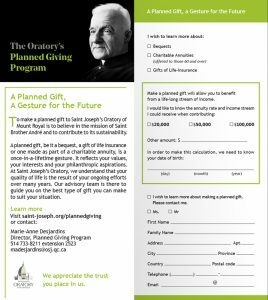 While direct donations are still very important in meeting the Oratory’s immediate needs, planned giving supports the sustainability and continuity of this institution. Making a planned gift is a gesture that helps build the future… wisely ! To request more information, please print and mail us this document or write to us at plannedgiving@osj.qc.ca. There are various types of possible planned gifts that offer significant tax benefits either upon issuance of the gift or upon the donor’s death. You would like to honor the memory of a loved one through a gift ? You can also make an In Memoriam gift online. Would you like to speak with someone about planned giving? You can also read testimonials from donors in the Archives of the Friend of Brother André Newsletter.